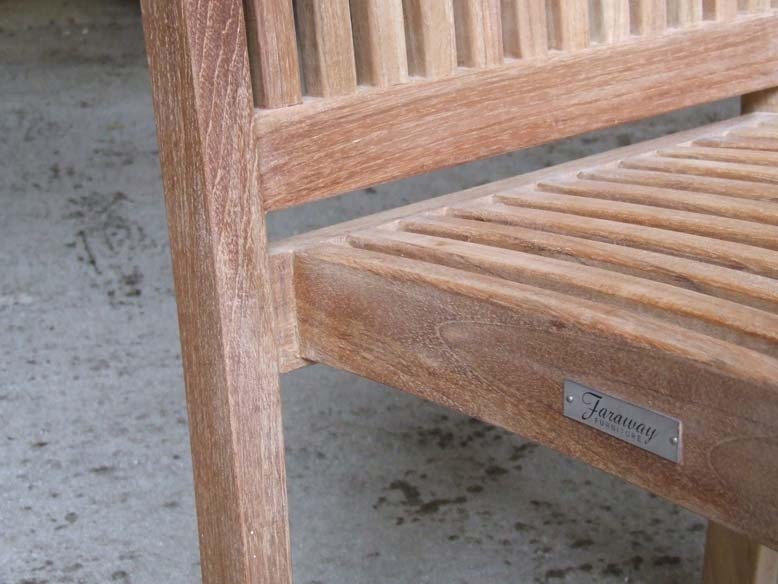 Teak Furniture Comparison Case Study - Please Read. To demonstrate what we discussed in the Crucial Teak Advice section, we decided to purchase a few chairs from some of our online competitors. We made a point of specifically choosing ones that advertise their furniture as Grade A and claim that their furniture should last a lifetime. They all offered only 1 year guarantee. We will start with a cheap copy of our Grenada chair. This copy was bought by us for £99.99 from an online garden furniture retailer. This seems to compare quite favourably with our Grenada which retails for £149.99. To the untrained eye, these chairs would look, if seen individually, identical and it is therefore understandable that someone would assume that they are getting a bargain. The first thing that strikes you when you look at the two chairs is the unnatural dark colour tones of the cheap copy on the right. This is because the cheaper chair is chemically treated using H2 SO4 (Sulphuric acid). 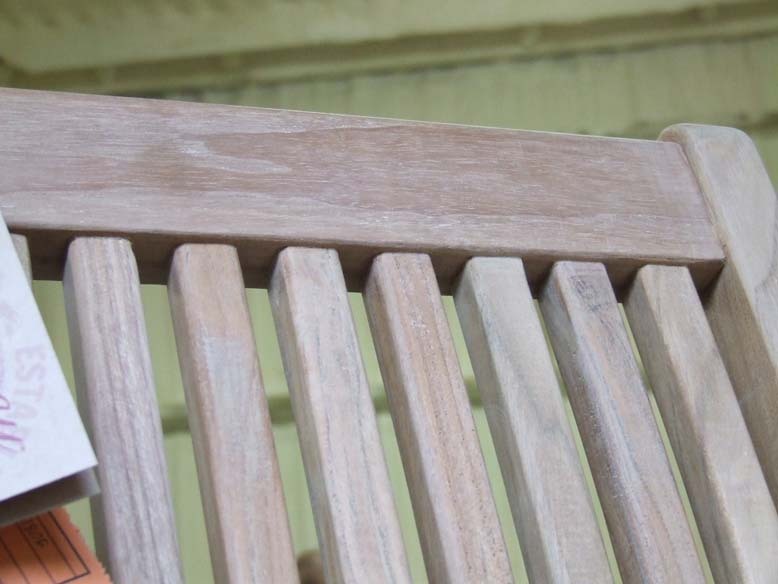 It is treated to disguise the fact that the chair is actually made from grade C teak however, the website we purchased it from claims it to be Grade A. You can get a glimpse of this on closer inspection of an area we spotted where the acid treatment was not kept on long enough for the timber to darken properly. Note the contrast between the light and darker colour patch. It is in fact grade C sapwood. Also notice that the chair uses corner supports where the front legs meet the seat base. These are typical signs of semi-machine or handmade chairs. 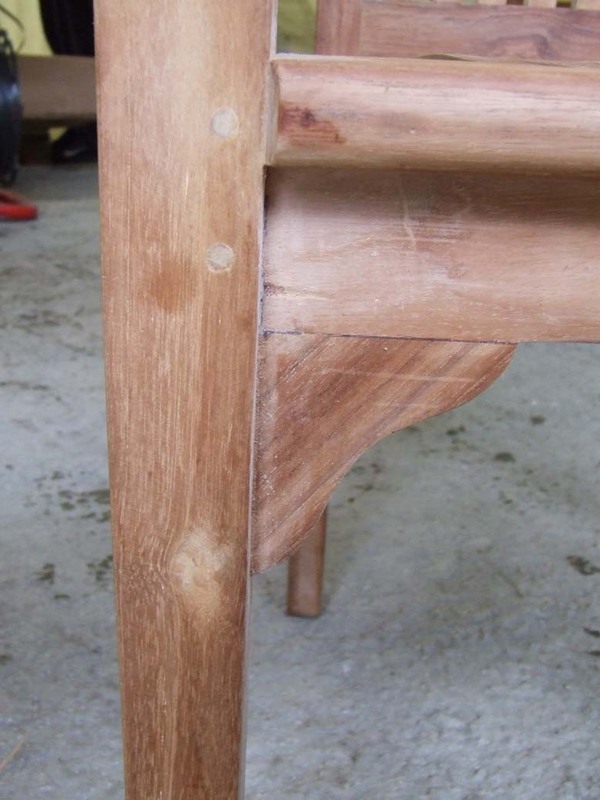 A well constructed, fully machine made chair does not need these unsightly supports as the tenon and mortise joints are an exact fit and therefore extremely strong. Here is another, cheaper, chair that we bought online. This time, the wood is very close to Grade A and completely untreated. 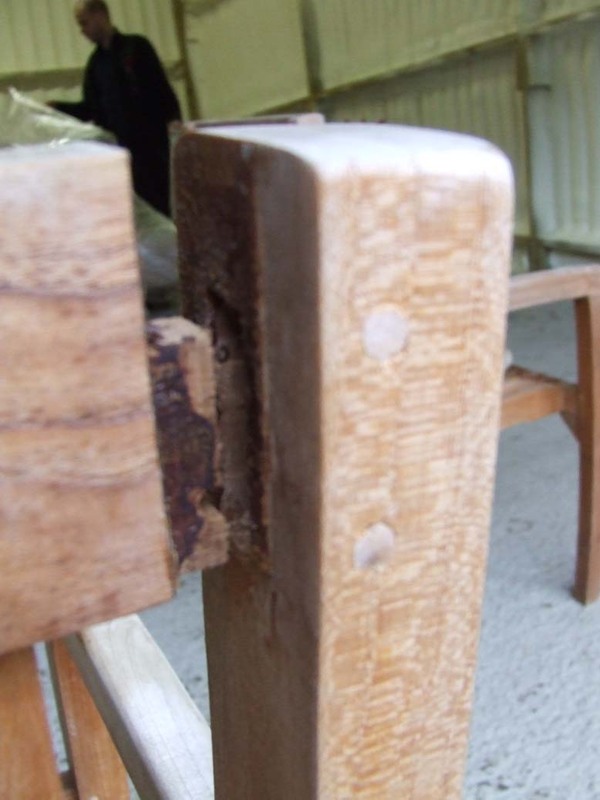 However, on a closer inspection we can see more tell tale signs of badly handmade furniture. Now compare that with our fully machine made Grenada. Pay close attention to the precise slots cut out for the ribs. 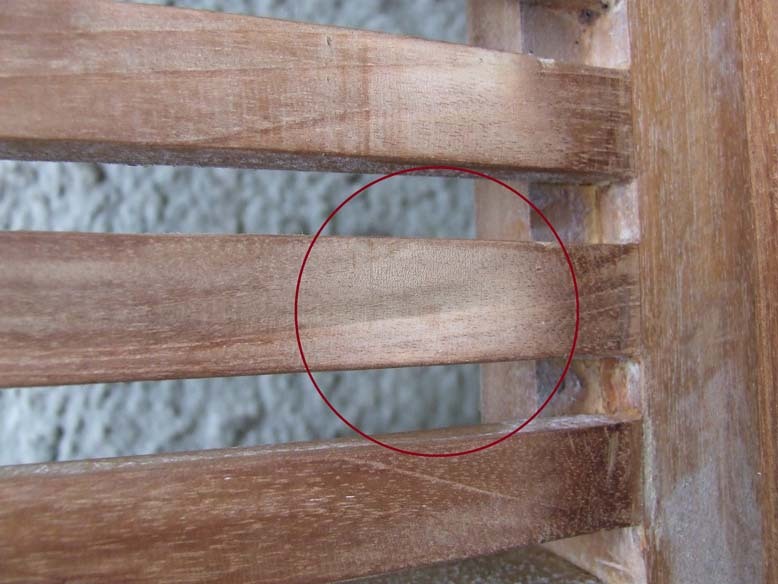 In this image, you can clearly see the accurate tenon and mortise joints and the oily nature of the close grained grade A teak used. When you run your hands over the chair, you can feel the oil resin on your hands. Sometimes, it is difficult to tell if a chair is well made from just appearances. Here we have an example of another Grade A, semi machine made chair which we placed outdoors over winter. The chair seemed to be better made than the rest with no gaps or any other obvious exterior faults. Upon inspection, we noticed the chair was starting to wobble quite badly. We noticed some glue failure on the joints and upon further investigation, it was clear why the chair was starting to fall apart. Note the way that the tenon was cut far too short. 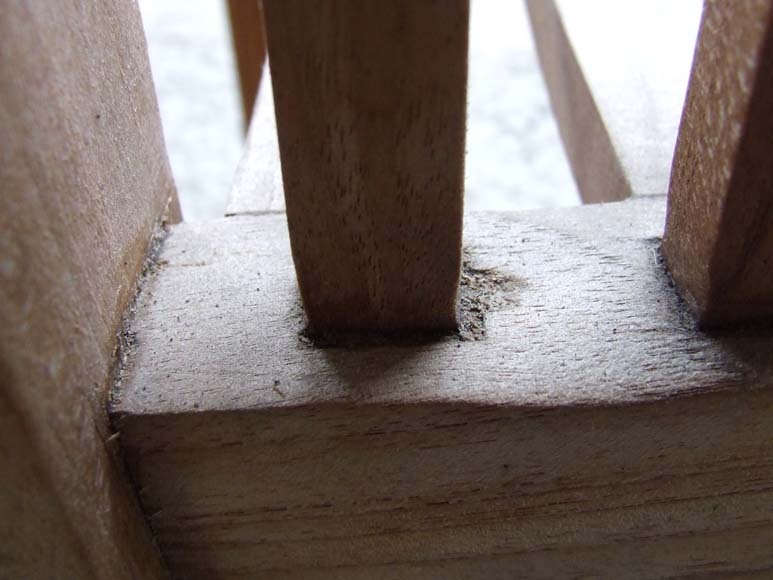 So short in fact that when the holes for the dowels were drilled, they completely missed the tenon they were supposed to go through. The only thing that was holding this joint together was the glue and due to the low quality of glue used, it would have completely failed in not much longer than a year. Be wary of retailers offering only a statutory 1 year guarantee and ask yourself the question; why do they not have more confidence in their own products? "Among timber, teak holds the place which the diamond maintains with precious stones and gold among metals." © Copyright Faraway Furniture all rights reserved.